The Keira Kilbane Foundation delivered a pantry and food items to stock the pantry to the pediatric oncology unit at UH Rainbow Babies & Children’s. 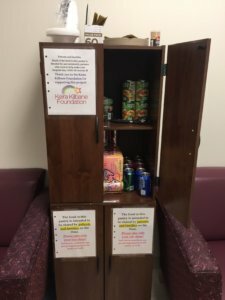 Childlife reached out to us and suggested that a pantry stocked with non perishable items would be a nice addition to make things easier on patients and families. We purchased the pantry, which will remain on the unit and the first round of items to stock the pantry. Other charities and families will have the opportunity to stock the pantry over the course of the year. 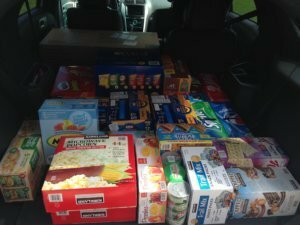 The items we provided were: microwaveable macaroni and cheese, soup, tuna, fruit cups, chips, popcorn, granola bars, pop tarts, and trail mix. We also bought four cases of non-diet pop, which we know families appreciate since only diet pop is available at the hospital. That is something you only understand if in that situation. Childlife sent us an update on the pantry and said that it has been well received and that it has become a “pay it forward” pantry, where if someone takes an item they replace it with another food item for someone else.